The Echinoblog: Five Points About The Fossil History of Echinoderms! Happy National Fossil Day! Five Points About The Fossil History of Echinoderms! Happy National Fossil Day! Here's one on paleocology & fossil parasites..
A nice gallery of fossil crinoids.. and this classic piece on giant floating/pelagic crinoids! Paleozoic Echinoderms: The Ophiocystioids! and the Helicoplacoids! 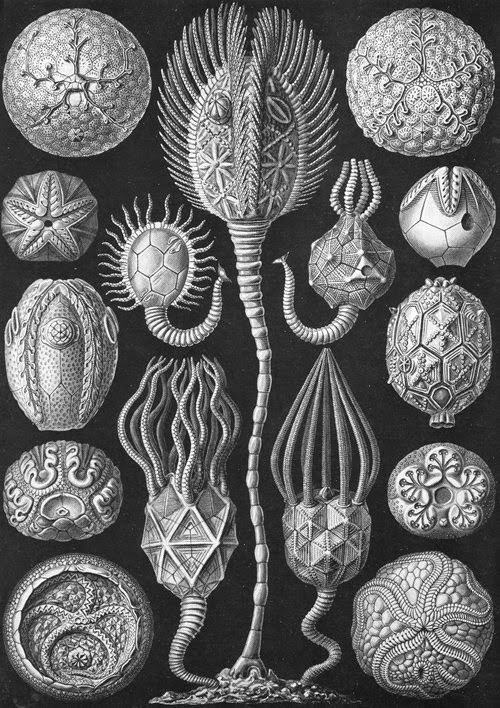 A LOT of the REALLY weird stuff in echinoderms takes place in the days of the Paleozoic, some 245 to 541 MILLION YEARS Ago... There was a lot of crazy stuff (evolutionarily speaking) happening then. Echinoderms, as a lineage PREDATE Dinosaurs and they've been around since before vertebrates walked on land. But here's a bunch of interesting facts I've cobbled together to better understand and appreciate fossil echinoderms and their history!! 5. Animal Body Type can bias preservation. This is really a dynamic of fossil preservation which is true for almost ANYTHING. In order for animals or any organism to undergo the fossilization process, it has to "survive" long enough to be buried and then kept together so that it undergoes the process. MANY factors can affect which animals/organisms/whatever are preserved in the fossil record. The study of how different factors affect fossil preservation is called taphonomy and it affects our perception of the history of life on the planet. One of those factors is the physical strength of the body itself. Is it delicate? Is it REALLY strong and tough?? Delicate, soft bodies tend NOT to preserve very well (although they can exceptionally) but some bodies with very heavy and strongly calcified bodies are MORE likely to preserve. So for example, these starfish, in life would have a fairly chalky body. They hold together pretty well when all the tissue is removed. Here's a whole bunch of crinoid stems preserved in limestone. These are pieces of the "stalk" in stalked crinoids. Hard parts that are pretty structurally solid. You're most likely to find this of all the pieces of a crinoid (aka a "stone lily"). 4. Preservation Environment is important. So, here's the thing. The fossilization process requires pretty RAPID burial of the subject organism/animal, whatever for fossilization to eventually take place. Which brings us to another "bias" of preservation: The environment!! If the animal lives in an environment in which it is predisposed to be buried ANYWAY, that makes it THAT much MORE likely that it will be preserved. One good example are sand dollars (or really anything which lives buried). Sand dollars have a pretty solid skeleton but ALSO live buried in sand. Sometimes, they can be killed by burial and pretty much just get preserved there in the sediment as it turns into rock. 3. 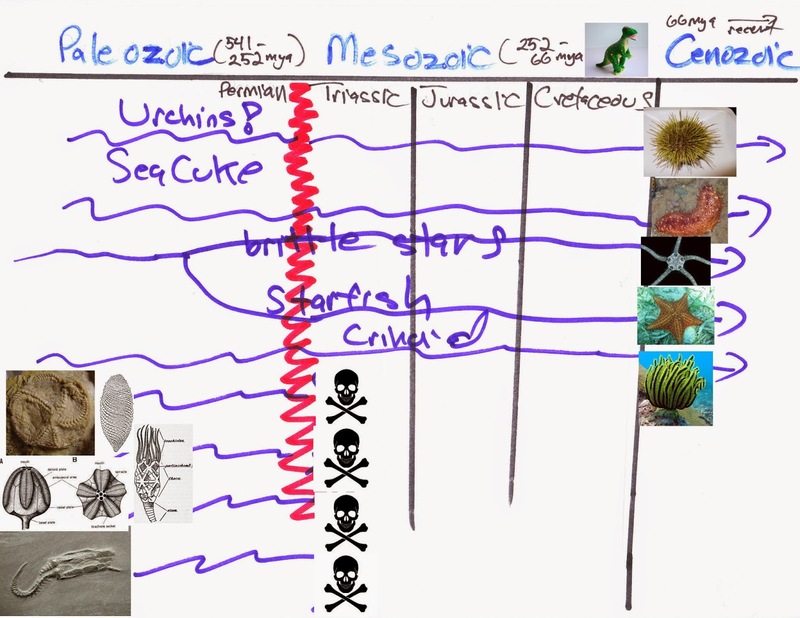 There were MORE KINDS of Echinoderms in the Paleozoic! One of the oldest questions from biologists unfamiliar with the fossil record is, "Why haven't you completely figured out the evolutionary history (i.e. phylogeny) of Echinoderms yet?? There's only FIVE of them!" Yes. Only five LIVING groups (crinoids, sea stars, brittle stars, sea urchins & sea cucumbers) are around today. BUT when you get into the VERY earliest days of echinoderms in the Paleozoic (245-541 MILLION years ago), you have easily TRIPLE the number of groups! (i.e. classes) and a crazy diversity of body plans NOT seen today! You got things that look like crinoids. Disc-shaped echinoderms. Accordian-shaped, asymmetrical echinoderms. Weird, crazy tentacle-balls. and all sorts of natural "experiments" in Echinoderm morphology. A crazy panoply of things! Oh, to go back in a time machine to see when rock was young! Picking up on the crazy, diversity of echinoderms mentioned above its worth mentioning that the ancestors of MODERN echinoderms were seen among them. Ophiocistioids for example are intermediate between sea urchins and sea cucumbers. That's kind of why some paleontologists get so twitchy about what you call a "sea star" versus a "brittle star". They have LITERALLY spent years arguing WHY that is the case.. So, then at the END of the Paleozoic, in the Permian, you have one of the most devastating MASS EXTINCTIONS known to life on Earth at the Permian-Triassic Boundary. That is the end of the Paleozoic and the beginning of the Mesozoic (i..e time of the dinosaurs). This extinction was huge. 96% of marine species were wiped out. Part of this? All those aforementioned echinoderm classes.. (about 15 of them)? GONE. Only survivors from FIVE groups survived to live on today. Here's a cartoon of this from Echinoblog Art Department! Echinoblog Art Department Lives on! Any one of these could be a whole blog post but this gives you a short summary of some dynamics involved with the rich fossil history of the Echinoderms! Happy National Fossil Day! What is that WEIRD THING on FACEBOOK?? ?